Not the most exciting week in JMU sports history, but there was still plenty to talk about. In the latest episode of the JMUSB Podcast, we discuss women’s hoops, a big lacrosse win over Towson, and even a little tennis. And of course we had some March Madness chatter after a pair of outstanding championship games. Then we wrap things up by discussing some of the things we didn’t appreciate as undergrads, but definitely do now. Like most people, I tend to think that it’s hard for others to define me. I’m a person of many interests, opinions, quirks, and behaviors. I’m a husband, a father, a Duke, a blogger, and a friend. I don’t think that’s its easy to sum up my personality with a single word or phrase. But if you really had to, it would be fair that I’m a “Stand to the right, walk to the left person.” Yes, I have strongly held beliefs on escalator behavior. Everyone does, right? So when I read this article alleging that it’s better for everyone to simply stand there like morons while riding an escalator, it rocked my world. I don’t think I’ve been this stunned since the gif pronunciation scandal of 2013. 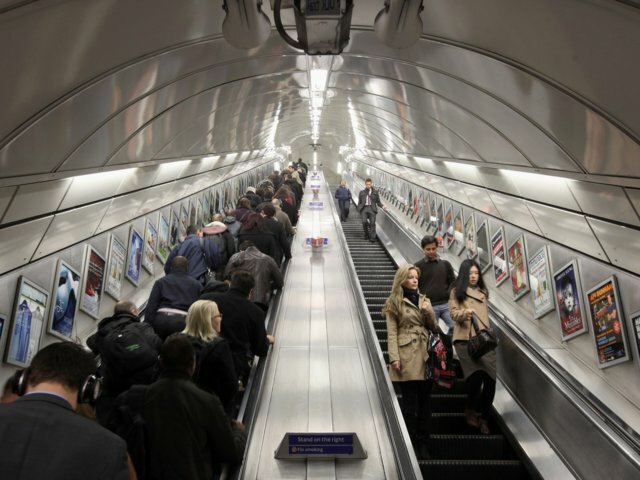 According to this tragic little escalator theory, if everyone simply stands in line, it reduces the jostling and maximizes the space per person. Or some such nonsense. I really was too upset to comprehend it. I always walk to the left. It’s what any normal person does. If these “human systems engineers” behind the study think they’ve cracked the code for maximizing benefit for the masses, I’ve got some bad news for them. They’re dead wrong. These fools claim that everyone will get to their destination faster, if we all just sit there like idiots and stand on the escalator. No! That’s a completely selfish perspective. People who stand on escalators by definition do not want to get to the top, or anywhere else, faster. They don’t care. They’re proudly telling the entire world that they don’t have effs to give and they’ll take their damn time getting wherever it is they need to be. And the great thing about that, is it affords people like ME, the chance to move to the left and scoot on buy them. It’s a win-win. Don’t try to impress your terrible views upon the masses human systems engineers. The escalator riding public has a social contract that we’re all good with. Don’t mess with it nerds. And now that I got that out of my system, here’s some stuff you might have missed this week. The entire JMU community stepped in a big way for JMU Giving Day 2019. 5,227 gifts and $1,142,945 of donations. We’re always proud to be Dukes, but especially so today. Great job everyone! Your defending National Champion JMU Dukes lacrosse team fell to UVA at home. It was a tough game, but the Dukes have a chance to right the ship with a huge home game against Maryland this weekend. The Diamond Dukes took 2 of 3 on the road against Cal State Fullerton, but then dropped one to Fairfield. Bad loss, but no reason to panic because the Dukes finally appear to have the arms needed to contend in the CAA. Coach O and the Dukes got hit with the injury bug at the worst possible time, which sent them tumbling out of the CAA tourney. Then they were one of the “First Four Out” for March Madness, which sort of flattered us, while also twisting the knife. In any case, there’s a game tonight to help fans move on. The women host North Carolina A&T in the first round of the WNIT on Friday. Dukes softball is rolling and Kate Gordon is hitting dingers. Lots of them. She’s slugging .900, which is pretty remarkable. The Dukes get CAA play going this weekend with a home series against Elon. JMU junior Bonnie Zhang made it to nationals for two swimming events. She already swam in the 50 Freestyle and is competing in the 200 Freestyle today. You can tune into the meet via the University of Texas streaming site. Finally, you probably saw this, but it’s worth sharing again. There’s a lot to be upset about nowadays, but we like to remind you that most people are good. Like this kid. In the latest episode of the JMUSB Pod, we welcome Justin Jannuzzi and Scooter Rankin from the JMU Duke Club to talk about JMU Giving Day. They discuss all the ways you can contribute and how your contributions help JMU athletics. We also chat about the heartbreaking way the JMU women’s CAA tourney ended early and finish things up talking about the JMU teams we wish we got to be a part of. As always, thanks to our wonderful sponsors, Mossy Creek Fly Fishing and Pale Fire Brewing. JMUSB Podcast listeners can swing by the shop on 480 East Market Street and mention the pod to get a free sticker. And then swing by our other loverly sponsor Pale Fire Brewing for a cold one. Mention the pod and you’ll get a free pint glass to take home after you finish your beer. That’s a wrap on the 2018-2019 JMU Basketballs season. The Dukes are done after day 2 of the CAA Tournament. After a beating Towson 74-73 in the opening (Dean Keener) round, JMU fell to top seeded Hofstra by the score of 76-67. JMU battled all day and definitely made a game of it against the Pride. Matt Lewis lead the way with 23 points and Darius Banks had a double-double with 15 points and 12 boards. Both guys went the full 40 minutes. This came after Lewis hit a clutch three in the closing seconds to defeat Towson. Stuckey Mosley chipped in 9 points in his final game as a Duke. It was revealed after the game that he’s been battling a shoulder injury for the past few games and was unable to lift his arm without pain. In the latest episode of the JMUSB Pod, we try to take a brief break from debating the future of JMU hoops. Instead, we have a little fun looking back and trying to come up with our all time JMU hoops starting five. And by “All Time” we mean the modern era. And by “modern era” we mean since us two old bloggers started school in the days of Lefty. In any case, we had a good time discussing some names from the past and think y’all should enjoy listening. The Dukes defeated Hofstra, the CAA Champion for the regular season, last weekend and opened the door every so slightly to finishing in the top 6 and avoiding the play-in round. Then the slammed the door shut by losing to Elon and William & Mary at home. Thus, the Dukes finished in 8th place and will start the CAA tourney by playing in the opening round against 9th seeded Towson. The winner will face top seeded Hofstra. The worst part? The game is on Saturday, so we can’t even call it Pillow Fight Friday anymore. Actually that’s not the worst part. The worst part is that it’s the third year in a row that the Dukes have failed to avoid the opening round. That’s bad. There’s no shame in losing to William & Mary. The Tribe was red hot down the stretch and is a team with plenty of talent. But losing to Elon is bad. Doing so at home with a lot on the line is ever worse. And doing it for the second time this season, is downright brutal. And the Dukes under Coach Rowe are a perfect 3 for 3 in finishing in the bottom four. Both of the most recent losses came down to poor shooting. JMU was an abysmal 25-69 against the Tribe and 22-51 against the Phoenix. That’s the story with these Dukes. The offense looks pretty much the same game in and game out. Whether or not they win, seems to come down to purely if they get hot shooting. It rarely varies. If they hit shots then win. If the shots aren’t falling though, then watch out. Because to most fans’ eyes, it doesn’t seem like they adjust their offensive approach. Lots of one on one play and launching threes. Frankly, it’s exhausting to be a JMU hoops fan right now. The Dukes can’t even finish in the top half of a CAA that is nowhere near as strong as it used to be. As of today, it’s the 18th ranked league in D1. And JMU is one of the teams dragging the league down. The Dukes showed flashes this season, but barring something truly extraordinary happening next weekend, this season will be a major disappointment. Nobody expected JMU to compete with Hofstra and Northeastern for the title. But nobody expected the Dukes to get swept by Elon either. Last year JMU played a lot of close games and had us excited to see the young team develop. This year the team struggled to show any consistency and often played down to their opponents. With only two seniors and a roster built around sophomores and freshmen, there’s reason to believe they could improve. But this is not where JMU wants to be and a decision on Rowe’s future must be made after the season. Do you judge him on the record and cut ties now? Or do you focus on the talent and the peaks and give him a chance to turn things around? It’s a big debate. And JMU can’t afford to get it wrong. We’re back with another episode of the JMUSB Podcast. It was a terrific weekend for JMU sports, highlighted by a big win over first place Hofstra in hoops. In this episode we talk all about the win and where things stand with Lou Rowe and the program. Then we wrap things up with a brief (for us) discussion about our dream guests for the pod. We also welcome our newest sponsor, Mossy Creek Fly Fishing, an amazing full service outfitter in Harrisonburg. JMUSB Podcast listeners can swing by the shop on 480 East Market Street and mention the pod to get a free sticker. If you’ve never fly fished before, I highly recommend taking the intro class. I did it and had a blast. And if you’re more experienced, treat yourself to a guided trip. And then swing by our other loverly sponsor Pale Fire Brewing for a cold one. Mention the pod and you’ll get a free pint glass to take home after you finish your beer. JMU finalized its first recruiting class of the Curt Cignetti era earlier this month, and we finally got around to discussing it on the latest episode of the JMUSB Podcast. Friend of the pod and JMU recruiting guru, Michael Evangalista, joined us. Having Michael on, enabled us to actually deliver some real insight into this class, instead of me and Todd just talking about 40 times and high school stats. It was a treat for us to get up to speed on some of the studs Cignetti is bringing to campus, and we think you’ll enjoy listening to this one. As always the JMUSB Podcast is brought to you by Pale Fire Brewing. Stop by the brewery for a beer and let them know JMUSB sent you and you’ll go home with a free pint glass. Be sure to subscribe to the JMUSB Pod via Apple Podcasts or Spotify. And give us a rating if you haven’t already.